Macau (Macao SAR) – March 27, 2019 (travelindex.com) – Led by chef Julien Royer, Odette is the first Singapore restaurant to take the top spot in Asia’s 50 Best Restaurants list. Odette ranks first as well at the Top25Restaurants.com/Singapore guide by Travelindex and the trusted Restaurant Rating Index. Top25Restaurants is the world’s first restaurant guide based on AI (articial intelligence and machine learning). 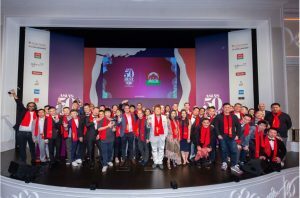 Foodies, Chefs and all fine dining lovers now await the new rankings at Top25Restaurants Guide Asia by Travelindex and the trusted Restaurant Rating Index. Top25Restaurants is the world’s first restaurant guide based on AI (artificial intelligence and machine learning).